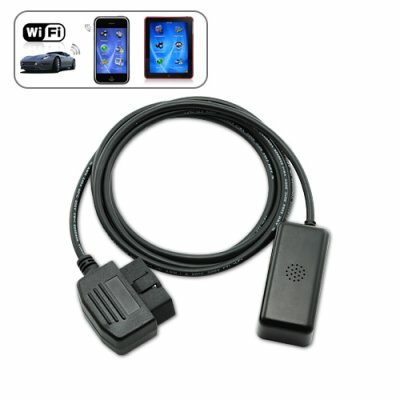 Successfully Added WiFi OBD-II Car Diagnostics Tool for Apple iPad iPhone iPod Touch to your Shopping Cart. Convenient and easy to use WiFi OBD-II car diagnostics tool for wireless connection with your Apple iPad, iPhone, and iPod Touch. Use with your WiFi OBD software of choice to easily monitor your car's information in real time! Save on maintenance costs and avoid headaches by detecting problems beforehand! More depending on what software you use! Note: Your vehicle may not support all above parameters. How many parameters you can get depends on the vehicle manufacturer’s implementation and software used on your iPhone/iPod Touch/iPad. For a fast, easy, and versatile solution to self-diagnostics for your car, look to this WiFi OBD-II Car Diagnostics Tool for Apple iPad iPhone iPod Touch. Available in our warehouse now, order today and we'll ship it to you tomorrow. Remember, the sooner you order, the faster you can start saving money on car check-ups! Brought to you by Chinavasion, the leader in wholesale electronics and car accessories. Show real-time information as you drive on your iPad, iPod Touch, and iPhone! Many different kinds of software can be used with this WiFi OBD-II Car Diagnostics Tool, just search for "WiFi OBD" on the Apple App Store. Example software include: Rev, DashCommand, FUZZYCar, Speedport. Please note that Chinavasion does not provide support or help with any software issues. . Compatible Apple Devices: Depends on the WiFi OBD Software used, but will require Apple iPhone, iPod touch and iPad iOS 3.0 or later and with WiFi capabilities. IMPORTANT NOTE: As the wholesaler, we provide the package containing the Car OBDII device. Chinavasion provides no customer support regarding its use. We cannot give advice regarding how to read codes or tell you if your model car is compatible with this particular product. If you have questions regarding the use of this device, we suggest you search for internet forums related to car maintenance. My Apple device finds and connects to this product, but nothing is working? After you connect with WiFi, set a static IP on your Apple device with: IP 192.168.0.11 or 192.168.0.10 and subnet mask: 255.255.255.0. I have it all set up, but the software I use isn't showing _____? Unfortunately, we are unable to provide support regarding any software use. Please contact the developer of the software you are using.